The Mid-Atlantic Capital (MAC) Conference is the premier venture conference in the region, bringing together the private equity and entrepreneurial communities. Over the years, it has been the catalyst for billions of dollars of venture funding and entrepreneurial activity. The day-and-a-half event offers both sponsors and attendees access to emerging companies from the Mid-Atlantic region; networking opportunities with the movers and shakers from the community; and educational panels and content sessions. The 2009 MAC Conference, Hosted by Blank Rome LLP, will be held on November 3 & 4 at the Pennsylvania Convention Center in Philadelphia. And this year, the MAC Conference, will feature a cleantech track, signaling the arrival of the sector as a significant component of the region's economy. Cleantech companies from the region featured at the conference include Benefuel, BG Automotive Group, Clean Water Resources, CogniPower, Confluense, Enersol Inc., Green Badge, Primet Precision Materials, SRS Energy, and TerraCycle. Rob Day of Black Coral Capital and Enertech Capital's Tucker Twitmeyer will be among the panelists addressing cleantech investing opportunities in the current environment. MAC Alliance is offering a special $200 registration rate for the full MAC Conference to the first 200 qualified entrepreneurs. This is an exciting opportunity for young entrepreneurs to get in front of some of the key players in the region. Spots are almost gone, so register today: entrepreneurs. First State Innovation (FSI), a non-profit whose mission is "to increase Delaware's entrepreneurial capacity by growing, attracting, retaining and connecting high growth technology-based businesses and supporting infrastructure in the state," held its first clean tech forum this past Thursday night, October 15th, at the Chase Center in Wilmington. Ernest Dianastasis, Managing Director of CAI and Chairman of First State Innovation, shared his vision for how the region can further innovation and business growth in the emerging green economy, and announced the formation of an angel fund, which will be managed by First State Innovation. Modular Carpet Recycling (MCR), Sanosil USA, White Optics, and Athena Biotechnologies were the featured companies presenting to a capacity crowd of investors, entrepreneurs, politicians, and service providers. Despite bad weather and the 8PM start of game one of the Phillies-Dodgers National League Championship playoffs, most of the audience stayed through all four pitches and three speakers. Eight other early stage companies in the clean tech and green space displayed their products and services at exhibit tables. Keynote speaker, Delaware Governor Jack Markell, spoke about the importance of addressing climate change and building a new economy around being cleaner, greener, and more sustainable. "To the 4Cs of Delaware: Chemicals, Cars, Chickens, and Credit Cards," quipped Governor Markell. "We need to add a fifth: Cleantech." Brian Yerger, an alternative energy industry analyst from AERCA Advisors, presented a state of the state's alternative energy progress and the global opportunity presented by clean technologies and renewable energy development. Yerger cited public support for government incentives, improvements in technologies, and competitiveness increasing scale as key drivers that may help the clean tech sector, which has been hindered by credit and economic conditions. Yerger sees hopeful signs that by Q4 2010, things will be back on track for what he views as "a secular energy transformation." Of the companies, I found Sanosil and White Optics to have the most interesting propositions. Sanosil, a Swiss-based company, produces a non-chlorine disinfectant from Hydrogen Peroxide and Silver. Two formulas, Sanosil Water Microbiocide, which is for use in cooling towers and industrial process water, and Sanosil Disinfectant, which has been proven effective against a range of viruses and infectious diseases, including MRSA, Swine flu (H1N1), and HIV and is for use in hospitals, offices, and childcare facilities. White Optics manufactures a patent-pending reflector that improves the efficiency and reflectance of traditional fluorescent light fixtures, such as found in most offices and older buildings or with newer lighting systems like LED arrays. First State Innovation plans to hold another Clean Tech Forum in Febraury 2010. "No matter how well we develop renewable energy sources, we will not be able to meet global demand," Pennsylvania Governor Ed Rendell said to the crowd gathered at BuildGreen09 in Philadelphia in his opening keynote. "We also need to reduce consumption." While Rendell gets the economic side, he also understands the limits and boundaries as well. It's not just about finite resources, according to the Governor, but about demand, which will increase as the population increases globally and as economies in developing countries improve and people prosper. Prosperity with sustainability was the tenor of the two day conference at Philadelphia's Sheraton Center City Hotel (a decidedly unsustainable venue, I might add). As Dr. Dayna Baumeister, co-founder of the Biomimicry Guild, noted in her fantastic presentation over lunch on Thursday, it is "about learning to live and build on a dynamic, non-equilibrium, water-based, boundaried world." And not only to survive, but to thrive. Others echoed these sentiments and highlighted the economic opportunity that presents itself right now and that is only at the beginning. Dennis Yablonsky of the Allegheny Conference on Community Development and former secretary of the PA Department of Community and Economic Development, cited a recent study indicating there is a $30-40B market in green building, which potentially grows to $200B if you add retrofitting of existing infrastructure. Companies all across the state are being created while older companies are reinventing themselves around the green economy, Yablonsky noted. There was evidence of this in the panel discussions, especially around product development and research. There you could find companies such as Armstrong, which started as a cork-cutting shop in 1860, as well as new initiatives such as the team of professors from Philadelphia University who are developing construction materials from alkali-activated fly ash, a waste product of the coal industry. Green jobs were also on the agenda at BuildGreen, with a focus on economic empowerment and the shortage of skilled and unskilled labor the new green economy requires. Education and training are needed, as well as a clear definition of what qualifies as a green job. Awareness of the existing opportunities is also needed, however, as was made apparent by Mr. Yablonsky's revelation that there are currently 30,000 "green jobs" posted on an online job bank for Southwestern PA. The jobs range from entry level positions to $100K+ executive roles; that's a lot of job openings in an economy that needs employment. Why are these positions not being filled? Philadelphia Mayor Michael Nutter also addressed the conference, repeating his pledge to make Philadelphia the Greenest City in America. His plan includes goals to reduce city energy consumption by 30 percent and energy costs by 10 percent, representing savings of over $3 million in a city budget that needs every extra penny. Philadelphia is not alone in trying to glean benefits from the new green economy. Micah Kotch, from the New York City Accelerator for a Clean & Renewable Economy, an incubator initiative of NYU-Poly aimed at stimulating invention, innovation, and entrepreneurship in New York. "Our goal is to grow an ecosystem of entrepreneurs, companies and local businesses around clean tech and renewable innovations," said Mr. Kotch. One of their companies is Rentricity, which captures energy from water pressure reduction -- common to any municipal water distribution system -- to spin turbines and create clean electricity. BuildGreen was convened by the Pennsylvania Green Growth Partnership and hosted by the Delaware Valley Green Building Council, which plans to host the international GreenBuild conference and expo in 2012. 1.) The transformation of the building sector to adopting green practices is both a great step forward and a great opportunity -- and other sectors, such as financial services, must now follow. 2.) The convergence of talent, resources, and infrastructure in the region is well-positioned to own a significant piece of the new green economy pie, but it still needs to foster and build the financing, commercialization, and innovation opportunities to seize the day. 3.) Biomimicry -- the conscious emulation of nature's design solutions -- is an increasing opportunity for innovation that can lead to sustainable products, companies, and services -- and a better way of life. If only we can "quiet our cleverness," as Dr. Baumeister put it. 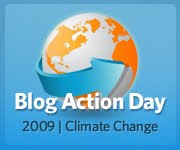 My post for Blog Action Day: Climate Change this year will be a non-post, in order to do my part to conserve energy resources and reduce my emissions. Warning, Chris agrees with me that a Carbon Tax is better and more efficient than Cap-and-Trade, but that the political will isn't there to get it done. Chris Nelder @nelderini and Charlie Rich Talk Sustainable Living and Farming and Renewable Energy from miss trade on Vimeo. Meant to blog about this over the weekend, but got distracted. I attended the first StockCamp hosted by StockTwits at the NASDAQ Market Site in New York City on Friday. The event was broken into two sessions -- morning and afternoon -- of about 4 hours each. I was at the afternoon session, which was packed with lively dialog on a range of trading subjects, including tools of the trade with StockTwits regulars Brian Shannon (@alphatrends) and Joe Donohue (@upsidetrader), tape reading and price behavior with Steven Place (@stevenplace), Mike Bellafiore (@smbcaptial) and Quint Tatro (@tickerville). Many of the StockTwits stable can be found on the stream and hosting web-tv shows about their specific trading concepts and ideas. Think of it as the anti-CNBC. There was also a mind-opening or mind-bending conversation with MacroTwits host Gregor Macdonald (@gregormacdonald), along with Jim Goebetz (@aiki14), Jason Wood (@Wood83), and David Aferiat (@tradeideas). Their subject? The Changing Economic Landscape, which ranged from gold to Australian and New Zealand currency to the complacency of the American public. Heady stuff. Keeping it all light and frothy was host Howard Lindzon (@howardlindzon), one of the founders of StockTwits, which has been built over the past year to include a desktop application, a web-tv network, subscription blogs, and now its own branded conferences. With so much intellectual capital and social leverage, can an acquisition of StockTwits be that far off? Rumor has it Howard was meeting with Google Finance last Thursday, so who knows? 3.) Next time Howard has an idea, and you're around at the beginning of it, make sure you have a piece of it.